The moon setting over the slopes. Views of the Breckenridge ski slopes. This gorgeous condominium is located 1000 vertical feet above Breckenridge with "million dollar views." The floor-to-ceiling windows in the vaulted living and dining areas have spectacular panoramic views of the Breckenridge Ski Resort area and the entire 10 Mile Range. It is spacious, tastefully decorated, and has all the amenities of home. The condo has three themed bedrooms including the "Garden Room" and the "Cherry Room," both with queen-size beds, and the "Bear Room" with a twin-over-full bunkbed. 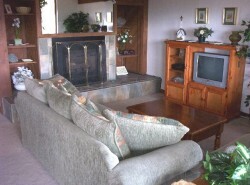 The family room also has a queen-size sofa sleeper which makes it easy to comfortably sleep nine. There are three full private bathrooms with a tub/shower in each. All three bedrooms have their own TV with cable. This stylish condominium has been completely remodeled in 2003 and has new furnishings, appliances, carpet, and tile. Designer decorative touches can be found throughout. The attractive, fully-equipped kitchen, gas log fireplace, large private deck, and one-car garage make this your perfect mountain retreat. The kitchen with generous pantry and breakfast bar adjoins the dining room with seating for nine. Cozy up by the fire or enjoy the sunny deck. Take advantage of the free shuttle service to four ski areas or relax in the ten-person hot tub after the day's activities. Whether skiing in the winter or biking in the summer this is the place to stay! Be one of the first to enjoy this lovely, five-star resort vacation home. Balance to be paid - 45 Days Prior to Arr to arrival.